Oh, come on. Surely you’ve heard of the iconic pioneering rap group Run-DMC. Well, Darryl McDaniels is DMC. Born in Harlem in 1964 and adopted at three months of age, he was raised in Hollis, Queens, where he’s still based. As a kid, he was passionately addicted to comics. Now, as a fully-fledged middle-ager, he’s make his real dream come true: his very own graphic novel. To do this, he created the independent publishing house, Darryl Makes Comics, along with Editor-in-Chief Edgardo Miranda-Rodriguez and music executive Riggs Morales. Interestingly, they’re not trying to create anything new, just present the beauty of the world already here. They believe “that every walk of life has heroes and stories worth telling,” to quote their press release. Along with his partner and collaborator Edgardo Miranda-Rodriguez, they’re launching DMC #1 (the first cover you see above) at New York Comic-Con this month, but the rest of you will have to wait until October 29 to get your hands on a copy. 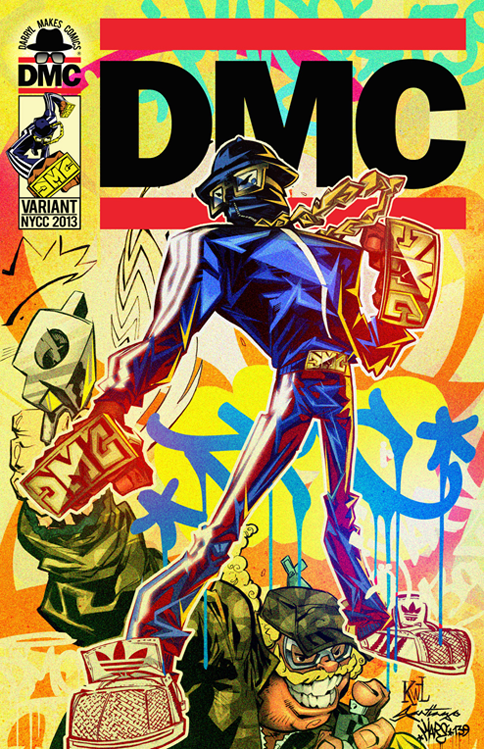 In the first DMC graphic novel, the reader visits 1985 New York City, a gritty, graffiti-covered town filled with b-boys breakdancing everywhere, and drugs and crime rule the day (I can personally attest to this; it was the year I moved to NYC and my parents were kind of worried. I found it all very interesting, on the other hand). 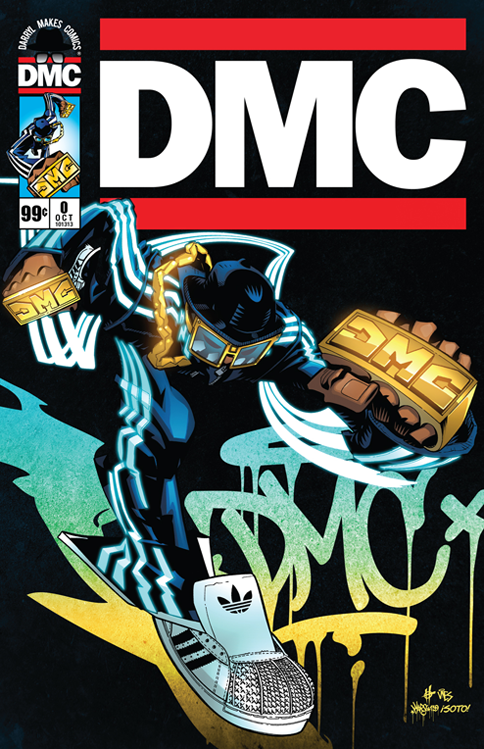 It’s in this time and place that our superhero DMC, wearing a tracksuit and Adidas sneakers, defends the weak and powerless…and fights against rival superheros and villains, too. Darryl McDaniels, our hero, is an English teacher by day, and a superhero by night, taking care of business along with a reporter and a band of graffiti artists.